Patricia (Pat) Parker Reid is lifelong Presbyterian growing up and being nurtured from a very young age in the Hopewell Presbyterian Church, near Blacksburg, SC. After high school Pat attended South Carolina State University earning a BA degree and a M.Ed. in Counselor Education from Winthrop University. In 2005 Pat completed Commissioned Lay Pastor Program after taking courses at the South Carolina Lay School and at University of Dubuque. Upon completing these studies, she was given opportunities to fill pulpits in Charlotte, Providence, Western North Carolina and Foothills Presbyteries. In June 2016, she earned a Masters of Divinity degree from Union Presbyterian Seminary. 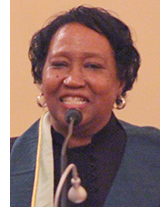 She served as an intern at Sharon Presbyterian Church and Sharon Towers, in Charlotte. She has served in the PCUSA as Ruling Elder, Committee on Ministry, Moderator of Providence Presbytery, Mission Resources Church Development, Committee, SDOP Moderator, and was a member of the 2008 Mission Experience Travel Team with Presbyterian Women. Pat is married to David Reid with a blended family of three children and four grandchildren. Pat has been called by God through the leading of the Holy Spirit to serve the church. She affirms her call. She is grateful to God for this call. "I look forward to serving and serving with and leading God’s people at Third Street Church." She is inspired by God’s Word and encouraged by many passages, one that speaks to her journey of faith is Phil.4:6…I am confident of this, that the one who began a good work among you will bring it to completion by the day of Jesus Christ.